When feeding your rabbit, your rabbit will be relying on you to provide them with the correct food for their health and well-being. There is some misunderstanding about what a rabbit can or cannot eat. A rabbit's diet should consist of 70 to 80% hay. The hay should be good quality grass hay, meadow hay or timothy hay. Along with the hay, you can add good quality nuggets for fibre, with occasional small amounts of certain fresh vegetables. You can use a water bottle or bowl, or both!, but remember, if you use a bowl it may be in the way of the rabbits space or spilt making the surrounding area wet. Hay (not to be confused with straw) is grass, or a mixture of grasses and other plant matter, and is essential to a rabbit's diet. Hay should be available for feeding your rabbit at all times as it provides roughage, important nutrients, gives healthy digestion and good dental health which is very important in avoiding discomfort and pain. When a rabbit is in its natural habitat (i.e. wild) it eats mainly grass plus other leafy plants and bark. Their diet is very high in fibre. Most domestic rabbits do not get the same opportunity with diet, so it is important to make hay, along with a little fresh vegetable/herbs (mentioned in the link above) and a small amount of fibre nuggets the staple part of their diet. Make sure that when feeding your rabbit nuggets, they are tasty and nutritious for your rabbit. Do not confuse nuggets with rabbit mix (muesli style food), which is commonly available. When feeding your rabbit muesli style food, the rabbit becomes selective, in that the rabbit picks out what it wants, therefore not getting a balanced diet and making the rabbit overweight. There may also be ingredients that do not agree with its sensitive digestive system. 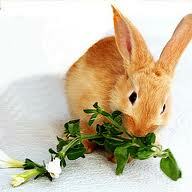 It is generally thought that rabbits love lettuce. Well, they may do but NEVER feed your rabbit lettuce. It can help in leading to gut stasis (GI stasis) an extremely serious gut complaint for rabbits. There are foods that you should NEVER feed to your rabbit. Try not to vary a rabbit's diet too much, again because of its sensitive digestive system. You can experiment by leaving a certain amount of food in the rabbit bowl, allowing the rabbit to go to the bowl at any time to feed, but if you find the rabbit keeps emptying the bowl before eating any hay, then this is not a good idea. Empty the bowl daily, throwing away old or stale feed and clean/wash the bowl regularly. When buying a food bowl, try to buy a heavy ceramic bowl. Plastic food bowls are easily overturned, stopping the rabbit from getting to their food. A good idea is not to place the bowl where the rabbit rests or near the toilet area. It is quite common for a rabbit to try and push its bowl to another area.